Everyone is welcome to join our Jane Austen discussion group. This month we'll be discussing Jane Austen in Scarsdale: Or Love, Death, and the SATs. Anne Ehrlich is a dedicated guidance counselor steering her high-school charges through the perils of college admission. Thirteen years ago, when she was graduating from Columbia University, her wealthy family---especially her dear grandmother Winnie---persuaded her to give up the love of her life, Ben Cutler, a penniless boy from Queens College. Anne has never married and hasn't seen Ben since---until his nephew turns up in her high school and starts applying to college. Now Ben is a successful writer, a world traveler, and a soon-to-be married man; and Winnie's health is beginning to fail. All of these changes have Anne beginning to wonder…Can old love be rekindled, or are past mistakes too painful to forget? 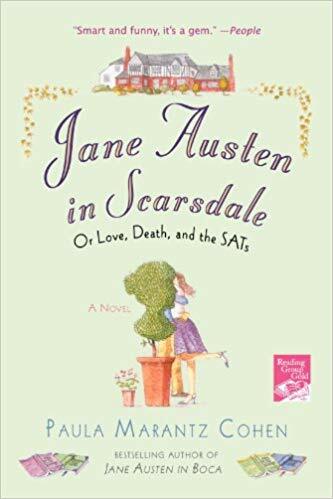 With all the wit and perceptiveness of Jane Austen's Persuasion, Jane Austen in Scarsdale is a fresh and romantic new comedy from a novelist with "a knack for making modern life reflect literature in the most engaging manner" (Library Journal).